Dr. Bingham-Lester is known as a premier kids’ dentist in Gambrills. She is a mother, and knows how critical it is to get children started on a path to lifelong oral health. We really enjoy our pediatric patients, and take extra time to be sure their visits are pleasant, with plenty of personal attention. You should schedule your child’s first dental appointment as soon as the first tooth appears, or sooner. This initial visit gives Dr. Bingham-Lester an opportunity to examine baby’s oral cavity development. For your convenience, your child’s appointment may be scheduled with your own. How to brush a baby’s tooth or teeth. By practicing good oral hygiene, Gambrills parents can lead by example. When your little one reaches school age, Dr. Bingham-Lester discusses nutrition and hygiene directly with the child. Our goal, is for oral hygiene to become a way of life for your child. Bingham-Lester Dentistry is your partner in preparing your child for a lifetime of good oral health. 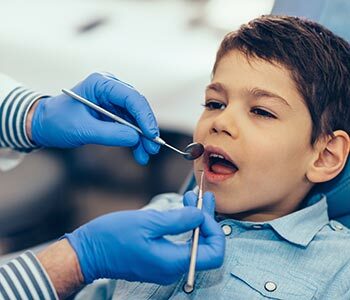 Sealant treatment can help your child have a cavity-free mouth. Dental sealant is a clear liquid, brushed onto the chewing surfaces of teeth. It flows into microscopic pits and grooves in the enamel, providing a barrier against cavity-causing bacteria. Treatment is fast, inexpensive, and painless, and lasts several years. A 2014 report by the Children's Dental Health Project indicates that dental sealant reduces cavities by 60 percent. Bingham-Lester Dentistry is your partner in preparing your child for a lifetime of good oral health. Call 410-885-6522 to schedule a pediatric appointment. Michele N "Office is beautiful, clean and inviting. Check in was very smooth and quick. My hygienist was great! Thorough and gentle and very informative. Dr Bingham-Lester was very professional, personable and I would recommend her!"